The biblical story of Moses and his campaign to free the Hebrew slaves from their Egyptian masters. In the grand scheme of cinema history, Ridley Scott is practically a newbie. After all, he arrived on the filmmaking scene after the generation of movie brats. Yet in his latter years, Scott gives the impression of a director who somehow defied the aging process, a holdover from Hollywood's golden age, more De Mille than De Palma. How many directors still chomp cigars, a vice also enjoyed by his late brother Tony, to whom Ridley's latest is dedicated? Scott is very much an Old Testament director, so who better to bring us the story of Moses? Scott delivers on the expected grandeur when called for, but Exodus: Gods and Kings is low on spectacle and high on skepticism. The 3D version renders his visuals indecipherably dark, giving new meaning to the phrase "Where was Moses when the lights went out?" In a controversial casting decision, the central characters are played not by Middle Eastern actors but British and American stars, with the smaller roles given to performers from the region as a consolation. While it's right that this should draw criticism, Scott did sadly have a point when he claimed the film wouldn't have found financing with "Mohammed so and so," as he bluntly put it, in the lead role. However, while Bale certainly has box office cred, I'm not sure how many viewers will purchase tickets to watch the likes of Joel Edgerton and Ben Mendehlson. Other more established names like Weaver, Kingsley and Turturro feature in little more than blink and you'll miss them cameos. 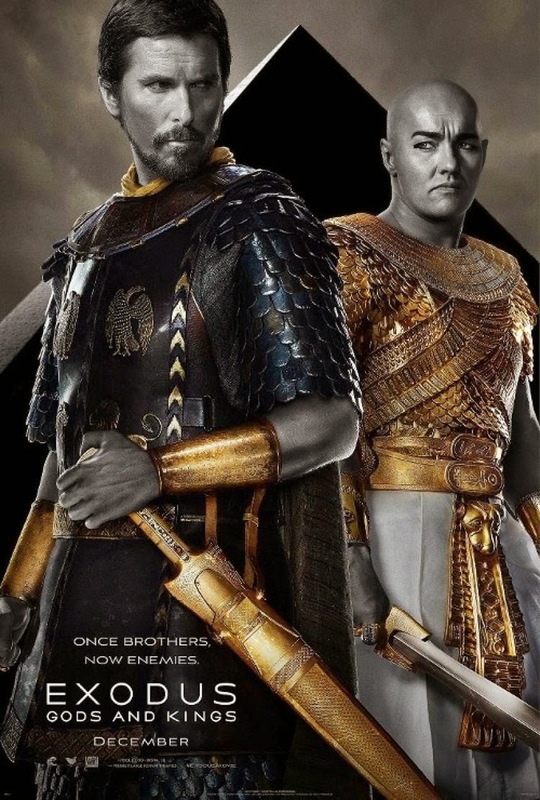 Had Scott simply whitewashed the cast completely, it ironically would have been less noticeably ludicrous, but watching a shaven headed Edgerton (whose fake tan makes him resemble a backing dancer at a Madonna concert) as Ramesses hold conversations with actual Middle Eastern actors simply accentuates the issue, making much of Exodus: Gods and Kings cringe inducing. Casting isn't the movie's biggest problem. The obstacle modern day Bible adaptations face is how to keep everyone in the audience happy, how not to offend both those who consider 'the good book' a work of fiction and those who base their entire way of life around its text. Exodus keeps it cards close to its chest in this area, keeping Moses' interactions with God (here envisioned as a cockney tyke, which is no more ridiculous than the traditional old dude with a beard look, let's face it) ambiguous. Has he actually been chosen by the big man (or little man, in this case), or is he merely a deluded fanatic? The answer is left up to the viewer, and how you choose to interpret this will affect whether you see Moses as terrorist or freedom fighter. It's this ambiguity, this politically correct attempt to ground a story of epic fantasy, that really irked this reviewer. Personally, I'm a non-believer, but when it comes to the movies I'm willing to put all my skepticism aside in the interest of suspension of disbelief. As such I want to see a Bible story that delivers on the fire and brimstone of a book that I may hold responsible for much of the trouble in the world, but nonetheless deserves the accolade of "the greatest story ever told." Get off the fence Hollywood; if you want to court the religious dollar, give the target audience what they want. The rest of us will happily go along for the ride.